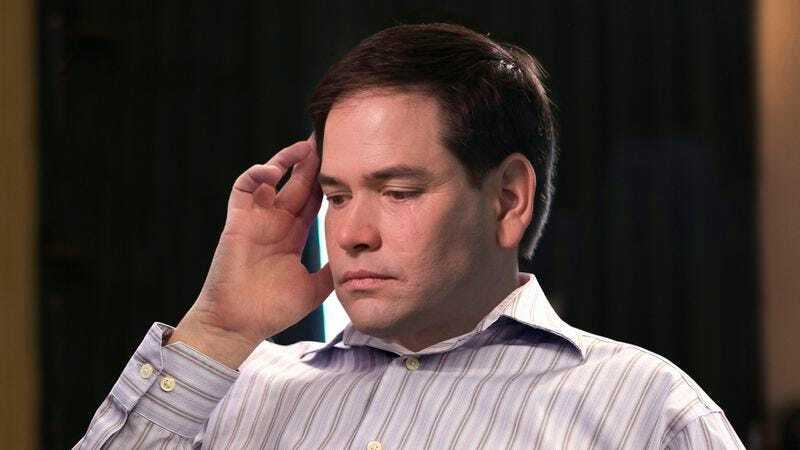 WASHINGTON—In an effort to comfort the distraught former presidential candidate, top GOP leaders reportedly sat down next to a sobbing Marco Rubio Thursday and assured him that it wasn’t his fault the Republican Party was splitting up. “Marco, trust me, this isn’t about you—we’ve been having problems for years,” said RNC chairman Reince Priebus, who consoled the weeping Florida senator by repeatedly telling him that the party’s breakup had nothing to do with anything he had said or done. “The fact is, we tried our best to work through our issues, but we just fought all the time. There’s nothing you or any of the other establishment candidates could have done about it. Okay, buddy?” At press time, Rubio had started blubbering even louder when Priebus admitted the party would probably never reconcile.